Take a close look at one of e-commerce's brightest stars, and at the search giant you use every day. Tech investors have a lot of choices these days. FANG stocks -- Facebook, Amazon, Netflix, and Google, now Alphabet (NASDAQ:GOOG) (NASDAQ:GOOGL) -- have grabbed many of the headlines in the financial press in recent years. However, there are other under-the-radar stocks that investors should get to know. One such option is MercadoLibre (NASDAQ:MELI), Latin America's biggest e-commerce provider. With that in mind, let's take a closer look at where MercadoLibre and Alphabet stand today, to determine which is the better buy. After an underwhelming 2018, MercadoLibre stock is back on the move. The Argentina-based e-commerce operator is already up 73% year to date, on the back of a blowout fourth-quarter earnings report. Combining its direct-sales e-commerce platform, a logistics service, a third-party marketplace, and a payment platform, MercadoLibre has built a complete e-commerce business -- and the company showed off that prowess again in the fourth quarter. Revenue in the period jumped 62% in currency-neutral terms to $428 million, and total payment volume jumped 69% to $5.3 billion as its MercadoPago payment platform has taken off. MercadoLibre has begun opening up MercadoPago for use off its platform, and off-platform revenue jumped 172% in constant currency. MercadoLibre also just scored a $750 million investment from PayPal Holdings, a vote of confidence from the leading digital-payments company. In recent years the company has grown in spite of economic upheaval across much of the region, as Brazil has been mired in a recession and hyperinflation, and Venezuela is in dire economic and political crisis. In spite of all that, MercadoLibre has put up consistent growth and fended off a challenge from Amazon. MercadoLibre already has 267 million registered users, but like e-commerce companies around the world, it should have a long runway of growth ahead -- as more Latin Americans move into the middle class, technology improves, delivery gets faster, and online shopping becomes more convenient. Check out the latest earnings call transcripts for MercadoLibre and other companies we cover. Alphabet has become one of the biggest companies in the world thanks to the strength of its search engine, ad network, and related properties like YouTube. Alphabet is the leader in digital advertising, and it's consistently seen solid top-line growth as more advertisers move their budgets from traditional media like print, television, and radio to digital. In 2018, revenue grew 23% to $136.8 billion, and paid clicks on Google properties jumped 66% in the fourth quarter, though cost per click continues to fall as a result of the company's auction system. However, Alphabet has ambitions beyond search: It has invested in "other bets" that include Waymo, the best-known of the bunch. Waymo is considered the leader in autonomous-vehicle (AV) technology, and some banks estimate its valuation at $150 billion. Waymo is taking baby steps into commercialization, and is now running a AV taxi service in Phoenix. Alphabet plans to license the technology to car manufacturers, and if it goes mainstream, the company could reap huge profits; AV technology has the potential to disrupt the entire transportation supply chain. Meanwhile, like Apple, Google has also built a healthy service business from apps and in-app payments, as well as its Google Cloud business. The Google "other" segment, which contains those businesses as well as hardware like the Chromebook and Chromecast, is Alphabet's fastest-growing, with revenue up 33% last year to $19.9 billion. With its overall strength and its growth businesses like Cloud and Waymo, Alphabet gives investors exposure to both strong profits and emerging technologies. What's the better buy here? Both stocks have their appeal. Alphabet is clearly the safer of the two, trading at a reasonable price-to-earnings ratio of 27. Meanwhile, MercadoLibre was not even profitable last year; the company dealt with headwinds such as a trucker strike in Brazil, rising postal rates, and accounting changes. However, investors have shown their willingness to extend MercadoLibre a long leash, much as they have with Amazon -- especially as MercadoLibre delivers local-currency revenue growth of around 60% and extends the reach of MercadoPago, which has the potential to be a high-margin business. Alphabet, for all its glory, is not without problems. The company keeps courting trouble with the European Union, receiving more than $5 billion in fines last year, and was slapped with another $1.7 billion antitrust fine just this month. Meanwhile, growing privacy concerns could put pressure on its advertising model, especially at YouTube, which has garnered criticism for spreading hate speech. The choice between MercadoLibre and Alphabet will come down partly to risk tolerance; investors who are more risk-averse are likely to prefer Alphabet. However, with the search giant already valued at more than $800 billion, the stock's chances of doubling in the future are slim. MercadoLibre, with its blowout revenue growth and long-term opportunity in Latin America, is the better growth stock of the two. 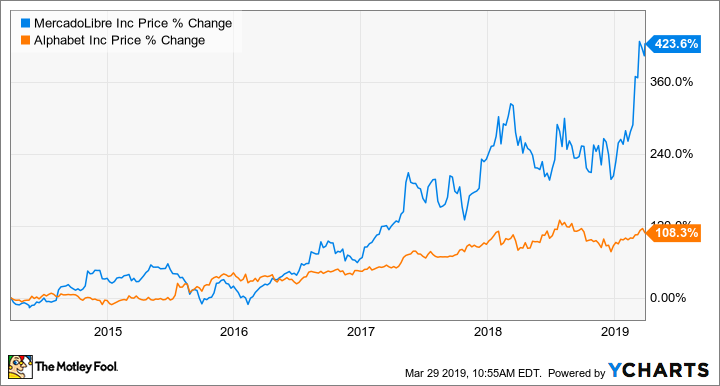 While there are plenty of good reasons to own Alphabet, MercadoLibre seems more likely to outperform, and still has the potential to be a multibagger.